Samsung has recently launched Samsung Star II S5263 in India which is the successor to the most popular Samsung Star mobile phone. The mobile phone features C-Type TSP touch screen for fast and smooth touch response. It comes with 3.0 inch 240×400 pixel TFT touch screen display. Samsung Star II S5263 runs on Samsung’s Proprietary OS. It comes with TouchWiz 3.0, Adavnced Widgets, Social Hub and Push Mail. It provides connectivity options like Wi-Fi, Bluetooth and USB and multimedia features like Stereo FM Radio with RDS and recording, 3.5 mm jack, Music Player and 3D Sound Technology. The phone provides 30 MB of internal storage which is expandable upto 32 GB with microSD card slot. Other features include 3.2 Mega Pixel camera, Mobile Tracker, Preloaded Java Games: Edge & Parachute Panic, Office Document Viewer that supports MS Office 2007, PDF and text files and offline e-mail support with MS Exchange. 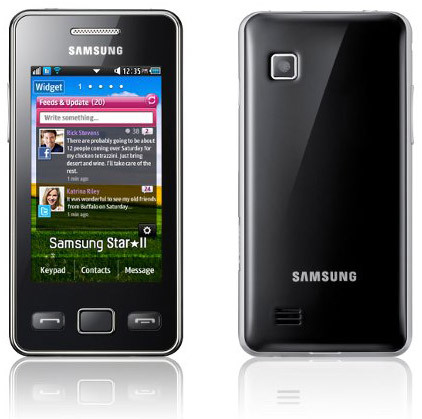 Samsung Star II S5263 also provide social media features with IM clients for Gtalk, Yahoo Messenger, AIM & Facebook Chat. The phone is priced at Rs 6540 and it is available in two colors – Black and White. Why do you want it for free Atif ? If you like this phone then you can buy it easily. It’s look Samsung is providing some great features in this model, can you tell me about capacity of battery used in this model. Samsung has really boomed the mobile industry in India within last 2 years and so, mainly after launching Aamir Khan as their brand ambassador. A good touch screen phone for basic users. yes but could have been better if it was Android based..as users just need to add few bucks to get their hands on Android nowadays.. This Phone Does Not Posses Much of Style Like Other Star Variants. Specially the Home Screen Doesn’t Attract me Much ! This phone is very good for use and it is a low cost ,branded ,toughtchScreen phone. It is really star beacuse only star persone have this.